How cool would it be to have a view in every room of this house? 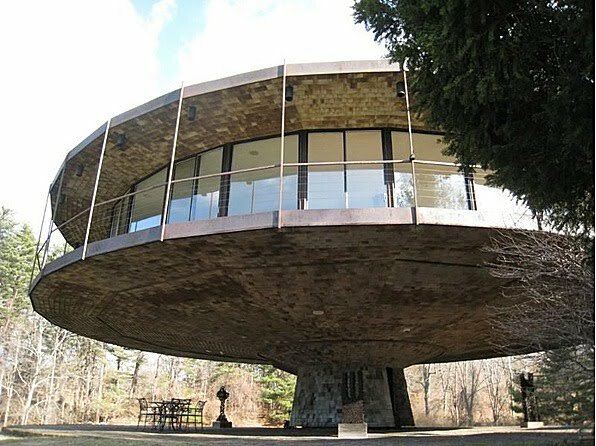 The Round House in Wilton, Connecticut is on the market for $1.75 million. Designed by the renowned architect Richard T. Foster assisted by Philip Johnson in 1967, this home was fully renovated in 2005. Walled in glass, this circular house can rotate 360 degrees, capturing beautiful landscaping and water views. This place is very space age; it looks like a landing spaceship to me. It seems impossible that the tiny base supports the entire home, but apparently it works. The Round House is 2,997 square feet and sits on 3.83 acres. If features a security system, beautiful hardwood flooring, a separate guesthouse, and even an in-ground pool.